The Maine Green Independent Party (MGIP) was founded in 1984, six months before the establishment of a national Green Party. We are the first and oldest state Green party in the United States of America, and home of John Rensenbrink, principal founder of what is now the Green Party of the United States (GPUS). We first became a qualified political party in 1994, after independent candidate Jonathan Carter received 32,695 votes, or 6.4% of the total votes cast for governor. We were officially called the Maine Green Party until we were scheduled to become disqualified in 1998 after 1996 presidential candidate Ralph Nader did not garner 5% of the vote in the 1996 presidential election -- a requirement at the time which has since changed. In 1998, independent candidate Pat LaMarche for governor with the attribution "Green Independent" on the ballot, to help re-qualify the party. Since the Maine Green Party had appealed to the Maine Supreme Court for an injunction to challenge our disqualification, LaMarche was unable to use the descriptor "Green" as an independent candidate, because technically, the Maine Green Party was still qualified while awaiting judgment -- hence, "Green Independent." When LaMarche received 28,722 votes, or 6.82% of the votes cast, our party re-qualified as the "Maine Green Independent Party." Although our name change occurred by happenstance, it is an accurate descriptor of who we are. Maine is known for political independence. As Greens, we are independent from corporate control that permeates the major parties, and we assert our independence as a state party to remain focused on issues important to Maine. 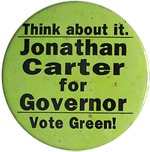 In 2002, Carter ran again for governor, this time as the Green Independent nominee -- our first nominee for governor as a qualified party -- receiving 46,903 votes, or 9.3%. In 2006, LaMarche, like Carter, ran a second time -- also her first run as a qualified party nominee -- receiving 51,922 votes, or 9.56%. This is the largest number of votes ever received by a Green candidate in Maine. In 2001, the first Green was elected to office in Portland, after which Greens have won 20 more elections in our largest city. 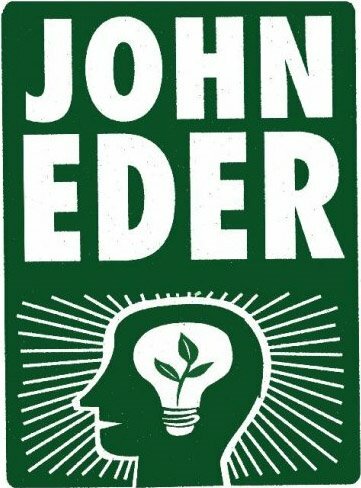 Among them, Rep. John Eder (G--Portland) became the highest ranking elected Green in the nation in 2002, serving for four years. With 44,569 enrolled Green Independents, or 4.2% of total voters as of the 2016 state election, the Maine Green Independent Party is the largest state Green Party per capita in the U.S. We almost always deliver the highest percentage of votes in the nation to our presidential nominee every four years. Collectively, we represents planet, people and peace before profit. We promote longterm interests of Maine people and aspire to leave Mainers a state that is healthier, safer and more just. As Greens, we believe the quality of our natural environment is intrinsic to a prosperous economy, healthy populous and quality of life for all. Our goal is to improve democracy toward these ends -- to elect officials who uphold our values, and hold elected officials accountable to our Green vision. The longstanding alternation between two political parties indebted to corporate interests has served neither people nor environment. We call upon Mainers to break free of attachments to "two-party" democracy and build a democracy where no single interest is afforded majority control of government that should be working for a diverse society. We welcome you to MGIP!. Many of you are Green already, although you may not realize it yet. Those of you who have already affiliated with us, please run for office to advance our ideals or support other Greens who will. For more information, please contact using the contact link.